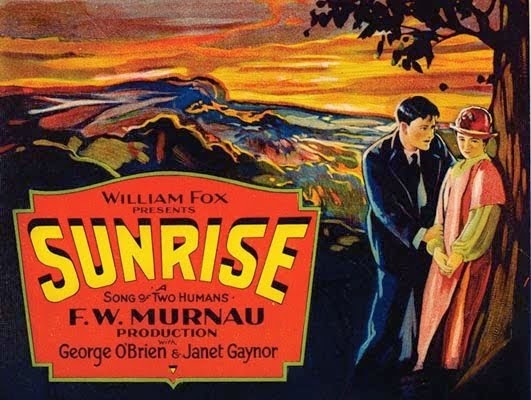 The multi-Oscar winner SUNRISE (1927), a silent film starring Janet Gaynor and George O'Brien, is a lovely, special film which touched me deeply. It was the ninth film on my list of 10 Classics to see in 2014. SUNRISE, directed by F.W. Murnau, is a deceptively simple tale, told with great beauty. It depicts 36 hours in the life of a farmer (O'Brien) and his wife (Gaynor). The struggling farmer is tempted by a "woman from the city" (Margaret Livingston) who convinces him that if he'll just drown (!) his sweet wife, he can run away from his cares and enjoy a life of passion with her in the big city. The man actually considers going through with it, then regains his senses, but his wife realizes what he had planned and is devastated by his betrayal. Over the course of a day in the city, the couple gradually have a moving reconciliation and a courtship of sorts as they rediscover their love for one another. But bad weather on the trip home may part them forever after all. That's all there is to it, told in 94 minutes, but what a sensitively acted and lovingly filmed movie. Janet Gaynor was the very first Best Actress winner for this film, but O'Brien is equally good as her guilt-ridden husband. The scene where he awkwardly guides her into a tearoom as he tries to regain her trust was very touching, as was the moment he fell apart and begged forgiveness in church. Although the plot at first seemed disturbing, ultimately it was quite an uplifting experience. I liked the fact that there were relatively few narrative cards interrupting the action. The movie flowed beautifully, with the story so clear and expressively acted that there weren't many cards needed to fill in the blanks. Karl Struss and Charles Rosher (who years later filmed the lovely SCARAMOUCHE) won the Oscar for Best Cinematography. 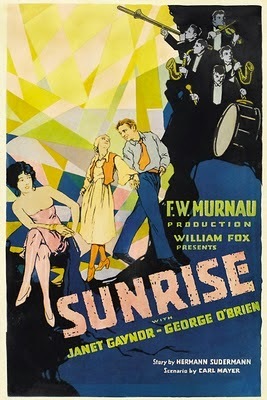 While WINGS (1927) won BEST PICTURE that year, SUNRISE received its own Best Picture award for "Unique and Artistic Production." SUNRISE is available on a limited edition DVD in the Fox Cinema Classics line. It's also available on Blu-ray. I caught up with Sunrise a few years ago while seeing the Sight & Sound Top 10. The story didn't sound remarkable on the surface, but I was blown away by it. It's one of the most visually inventive films that I've ever seen, particularly with the trip to the city and the boat ride. So well done! Wonderful, have only ever heard good things about this movie; can't wait to finally see it! Dan, you hit on something I didn't capture in my post, how inventive and visually beautiful it was. Even the way a couple of the narrative cards were done was very artistic and contributed to the story rather than being interruptions. I was also impressed by the movie's recorded soundtrack which included sound effects such as train whistles and bells along with the musical score. Those sounds also added a great deal. Kristina, I'm so glad this is on your list and hope you will enjoy it too. I wasn't quite sure from the plot description if I would like it but felt I should try it because it's considered such an important film -- and stars George O'Brien. :) This is part of the value of my list challenge, I pushed myself to try it and I found myself deeply rewarded by the experience. I'm so glad you enjoyed Sunrise! I credit it as the first movie that really made me understand silent film as an art form. I'd enjoyed silent comedy before, but aside from that hadn't really managed to get into it. With Sunrise I finally understood what people meant when they talked about the visual style lost with the transition to sound. Some of that style thankfully came back eventually! Jandy, I'm like you, I started in silents with Harold Lloyd, then THE WINNING OF BARBARA WORTH and SUNRISE. Both BARBARA WORTH and SUNRISE are visual stunners and have so impressed me that they've helped me to move beyond my dislike for narrative cards (which can be very tedious for a quick reader) to become more interested in silents.